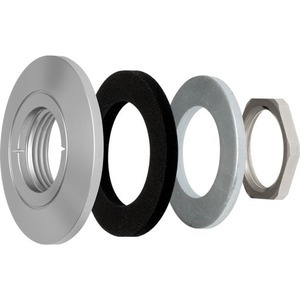 AXIS F8212 Trim Ring, sold in packs of 10, enables AXIS F1005-E/F1035-E Sensor Units and AXIS P1214-E/P1224-E Network Cameras to be recessed mounted and easily secured on a glass, plastic or metal panel. For AXIS F1005-E, the thickness of the panel should not exceed 11.5 mm (7/16 in.). For AXIS F1035-E/P1214-E/P1224-E, the thickness of the panel should not be more than 8.5 mm (5/16 in.). The cover ring's diameter is 4.5 cm (1 3/4 in. ).